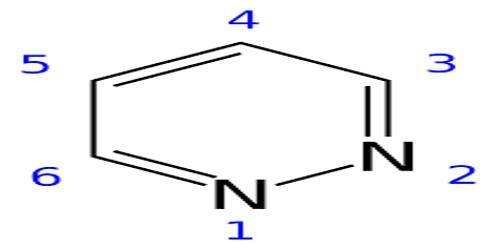 Pyridazine is a heteroaromatic organic compound with the molecular formula C4H4N2, sometimes called 1,2-diazine. 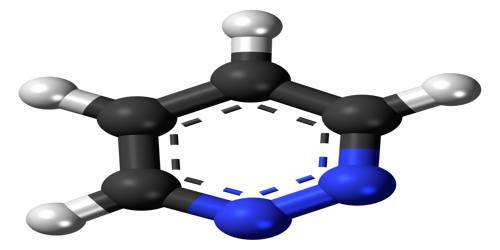 It contains a six-membered ring with two adjacent nitrogen atoms, and is aromatic. It is a colorless liquid with a boiling point of 208 °C. The pyridazine ring system is a 1, 2- diazine or o- diaza benzene. It is a planar molecule for having a maximum of two kekule structures possible. Historically, pyridazines were first named by Knorr, while Fischer3 prepared the first substituted compounds but Tauber was the first to synthesize the unsubstituted pyridazine. At room temperature, it is a colorless liquid with pyridine like odor, owing to its imine functional groups, and has a relatively high boiling point (2080 C) and low melting point (-80 C). 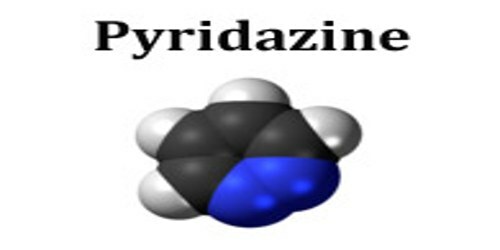 Pyridazine has no household use. It is mainly used in research and industry as building block for more complex compounds. Pyridazines are heterocyclic compounds with an N-N bond in their ring structure. The pyridazine molecule is a π-deficient heteroaromatic compound similar to pyridine. Due to the presence of the π-deficient nitrogen aromatic heterocycles these compounds are more easily soluble in water when compared to other hydrocarbons. The basic aromatic ring system of pyridazine contains two adjacent nitrogen atoms. The parent heterocycle was first prepared by oxidation of benzocinnoline to the pyridazinetetracarboxylic acid followed by decarboxylation. A better route to this otherwise esoteric compound starts with the maleic hydrazide. These heterocycles are often prepared via condensation of 1,4-diketones or 4-ketoacids with hydrazines. 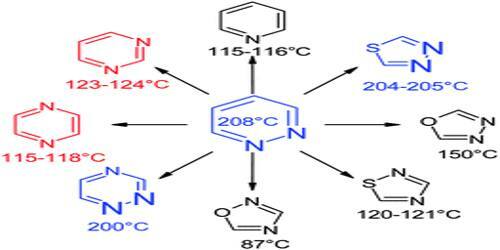 Pyridazines are effective water oxidation catalysts with high efficiency turnover numbers up to 700. The pyrazine ring is a component of many polycyclic compounds of biological or industrial significance. Important members of the pyrazine family include pteridines, alloxazines, and phenazines. Pyridazines are rare in nature, possibly reflecting the scarcity of naturally occurring hydrazines, common building blocks for the synthesis of these heterocycles. The pyridazine structure is a popular pharmacophore which is found within a number of herbicides such as credazine, pyridafol and pyridate. It is also found within the structure of several drugs such as cefozopran, cadralazine, minaprine, pipofezine, and hydralazine.